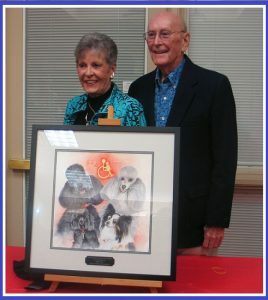 History & Founders – Pets On Wheels of Scottsdale, Inc.
Pets on Wheels of Scottsdale, Inc. was founded in 1990 by Neal C. Jennings, a retired civil engineer – with the help of his wife, Anne. They are shown here with a collage of their past therapy dogs, Jacques & Jill and Ronnie & Clyde. The water color painting, created by Scottsdale artist, and member of the POW Board, Diane Bykowski. was presented as a gift from the POW volunteers at a retirement reception October 25, 2012. With the blessing and cooperation of the City, Neal started the pet visitation therapy program with two dogs and one nursing home. The premise was to provide a superior service to a limited area, rather than spread less frequent pet visits throughout the Valley. Neal retired from the presidency in April 2012, after 22 years and over 20,000 volunteer hours, managing over 1,800 volunteer-pet teams visiting during that time. At the reception, a proclamation signed by Scottsdale’s Mayor, Jim Lane, was presented declaring October 25th as Neal Jennings day in Scottsdale. Both Neal and Anne have taken lesser roles in the organization. Ron Lonie took the reins from Neal as president from 2012 until 2014, followed by long-time volunteer and board member, Peggy Eischen.